This week in China’s media, state broadcaster CCTV got a talking-to for its “National Brand Project,” with regulators saying it might be a violation of the country’s Advertising Law for the network to designate national brand status for sales of prime-time ads. 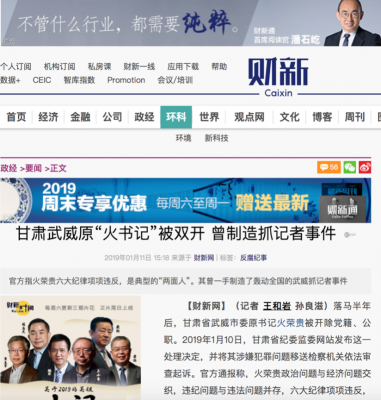 Another media controversy this week concerned the practice of “article laundering,” after an in-depth report by investigative reporter Wang Heyan available only behind the paywall at Caixin was shared in regurgitated form by a another journalists on his WeChat public account. 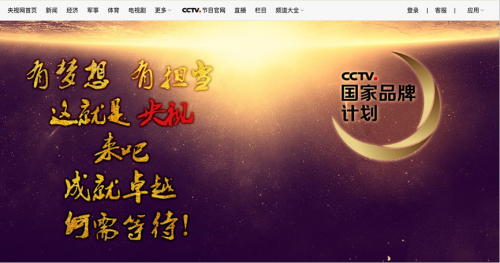 China’s State Administration for Market Regulation (SAMR) posted a short message on January 17 revealing that it had met with representatives from the state-run China Central Television to discuss the network’s “CCTV National Brand Project” (CCTV国家品牌计划), a scheme possibly in violation of China’s Advertising Law. SAMR has reportedly instructed the Beijing Bureau of Market Regulation (北京市市场监管局) to launch an investigation. 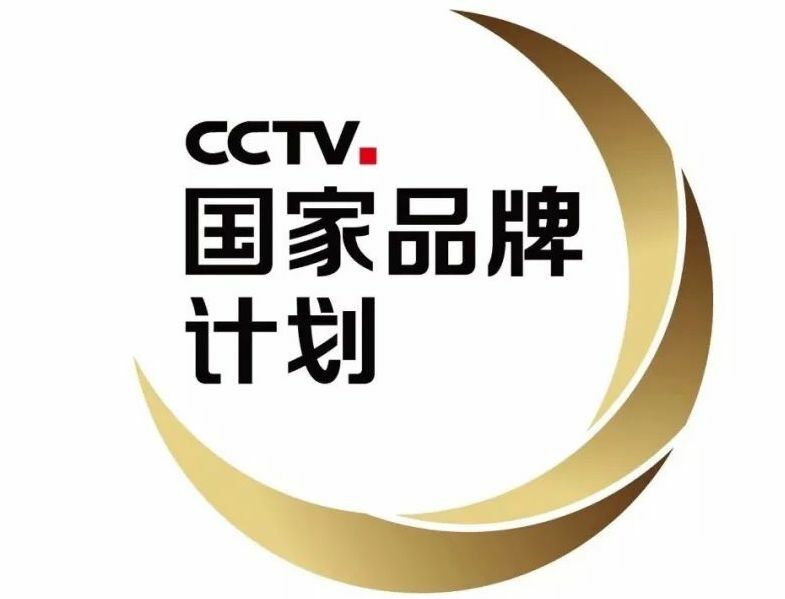 The “CCTV National Brand Project” is an advertising strategy used by CCTV, China’s national broadcaster, in which participating advertisers are offered identification as “national brands” in advertising slots appearing during premium state-run programs such as “Xinwen Lianbo” (新闻联播) and “Focus” (焦点访谈). The network also produces specialised advertising for participating brands, which in the past have included Hongmao Medicinal Wine (鸿茅药酒), Yunnan Baiyao (云南白药) and Luhua (鲁花). 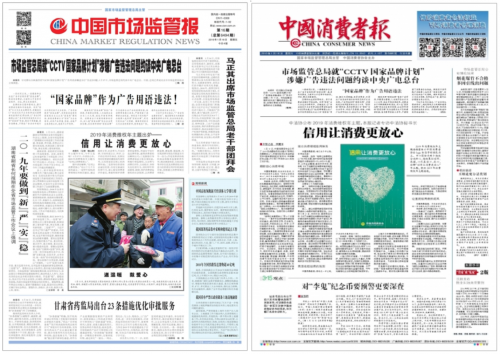 On January 18, China Market Regulation News (中国市场监管报), a newspaper published by the State Administration for Market Regulation, said in a commentary: “General Secretary Xi Jinping has said that ‘advertising must also follow [correct] guidance.’ The greater the influence a media has, the more it must set an example, doing business in accord with the law.” President Xi made the reference to ideological control (“correct guidance”) over advertising during his February 2016 speech on media and public opinion, the same speech in which he said all Party-run media must be “surnamed Party,” serving the interests of the CCP. On January 11, Caixin Online, one of China’s leading online sources of reporting on economics and current affairs, ran a story by veteran investigative reporter Wang Heyan (王和岩) called “Former ‘Fire Secretary’ of Gansu Wuwei Stripped of Post, Once Orchestrated Arrest of Journalists” (甘肃武威原“火书记”被双开 曾制造抓记者事件). Reported first-hand, Wang’s story chronicled the corruption case of Huo Ronggui (火荣贵), the former top leader of Gansu’s Wuwei city, who was behind the detention in January 2016 of three journalists writing for commercial media in Gansu [See CMP’s coverage here]. That same night, another veteran journalist, Huang Zhijie (黄志杰) ran a story called “Gan Chai Lie Huo” (甘柴劣火) on his own public WeChat account, “Yo Yo Lu Ming” (呦呦鹿鸣). The story was essentially a compilation of Wang Heyan’s Caixin story, and reporting from China Youth Daily and other media — but it spread like wildfire on social media. Wang Heyan responded with consternation in her personal WeChat group: “This article [from Huang Zhijie] is a cost-free ‘copy’ of my own report running at Caixin behind a paywall.” Before long, the Huang Zhijie “copy” had sparked a heated discussion among media professionals about the violations of copyright and other ethical violations in Chinese media, with many people speaking out against so-called “article laundering” (洗稿), the repackaging and plagiarising of original content. Huang Zhijie is a former lead writer for Oriental Outlook (瞭望东方周刊), magazine published by the official Xinhua News Agency, and executive editor of the magazine New Media (网络传播). On January 4, veteran journalist Wang Zhi’an (王志安) made a post to his WeChat public account, “Wang Ju’s Private Plot” (王局的自留地), with the no-holds-barred headline: “Quanjian [Group] Should Die, But It Isn’t the Only One That Should Die” (权健该死，但不是只有它该死). Wang’s story used the recent police investigation into Chinese health products manufacturer Quanjian to discuss the 2016 death of cancer patient Wei Zexi (魏则西), who was cheated out of 200,000 yuan in fraudulent cancer treatment after being directed to seek care in Beijing through a paid search promoted by the Baidu search engine. Baidu faced a wave of public anger in 2016 over the Wei Zexi case, prompting an investigation and apparent changes in ad policies, though Chinese media subsequently reported that similar advertising by the search engine had returned within a year of the tragedy. On January 17, Wang Zhi’an again made a post, this time called “Baidu, I Invite Your Lawsuit!” (百度，欢迎来告!”), in which he revealed that Baidu had filed a complaint after his Quanjian post. Baidu’s complaint to WeChat reportedly read: “This article has already constituted a malicious slander against the Baidu brand, seriously harming the reputation of our company and our brand. We ask that you assist us in deleting this article. Our company will use legal means and channels to protect its own legal rights and interests.” Wang Zhi’an publicly denied that his post had infringed on Baidu’s rights, and said he would “see the matter through to the end” (奉陪到底). At 2:15AM on January 15, poet, playwright, novelist and essayist Bai Hua (白桦), one of China’s best-known artists of so-called “scar literature” looking back on the repression and chaos that descended on China from the late 1950s through to the end of the 1970s, passed away in Shanghai at the age of 89. In September 1979, Bai published his most famous work, Bitter Love (苦恋), which dealt with the suffering that the Cultural Revolution had inflicted on China, earning sympathy from the public and sharp criticism from Chinese authorities. In 1982, Bai’s work was adapted for the screen in Taiwan by director Wu Nien-jen and given the English title “Portrait of a Fanatic.” In one of Bitter Love‘s most famous (and for authorities, unwelcome) lines, the main protagonist, Ling Chenguang (凌晨光), is asked by his daughter: “You love this country, bitterly love this country . . . but does this country love you?” The line became immensely popular at the time. 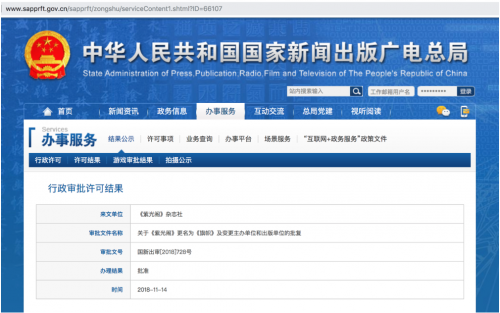 According to information from the National Radio and Television Administration (NRTA), the decision to rename Ziguange as Banner, and to change its publishing institution, was approved on November 14, 2018. “Ziguange” is the name of an ancient building in Zhongnanhai (中南海), the former imperial garden, that is routinely used by State Council leaders to great foreign guests.